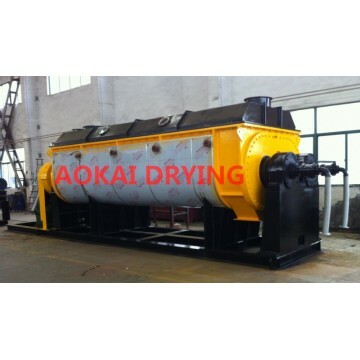 Paddle dryer is a kind of mixing dryer at low speed by conducting heating. There is a jacket layer on the dryer drum and hollow blades on the hollow axle which the hot carrier is passing through. Wet materials will make heat exchange with heating surface of drum and the blades when they are agitated by blades. This dryer is suitable to dry various kinds of paste, granules and powder material which have good thermal stability and can dry heat sensitive materials under special conditions. Solvent can be retrieved during the process of drying and heating medium can be steam, hot water, hot oil etc. Typical materials to be dried are: carbon black, calcium carbonate, plaster, clay, nylon and polyester slices, polyethylene etc. Compact structure, large area of heat conducting, small occupied space, less air consumption and less dust. Blades have self-cleaning function by their interaction and materials have longer dwell time and high filling coefficient.